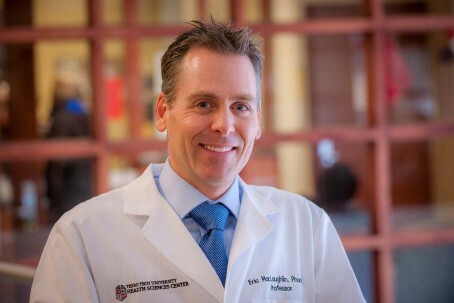 The award-winning TTUHSC pharmacy professor helped write the American Heart Association's guide on high blood pressure and earned the Texas Tech University System's highest faculty honor. To improve health and long life, Eric J. MacLaughlin champions a collaborative approach to health care. 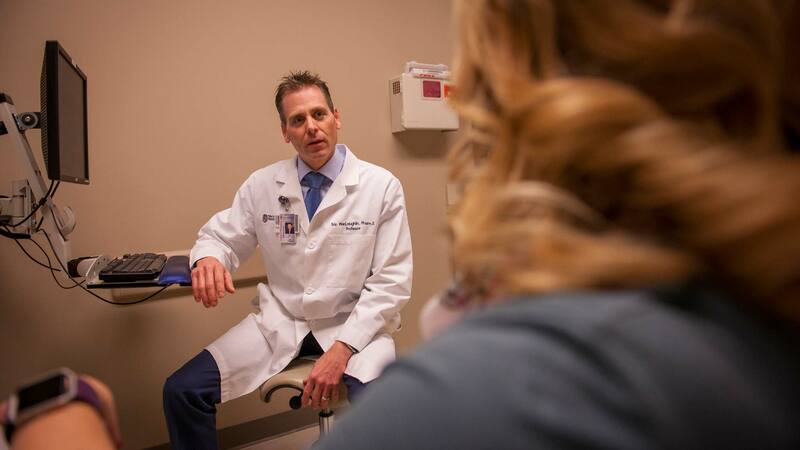 “With team-based care, pharmacist and physician work together to improve patient care,” said MacLaughlin, professor and chair of the Department of Pharmacy Practice at Texas Tech University Health Sciences Center at Amarillo. Exemplifying the shift to more collaboration among medical professionals was MacLaughlin’s invitation to join the national committee responsible for writing national guidelines for diagnosing and managing high blood pressure. 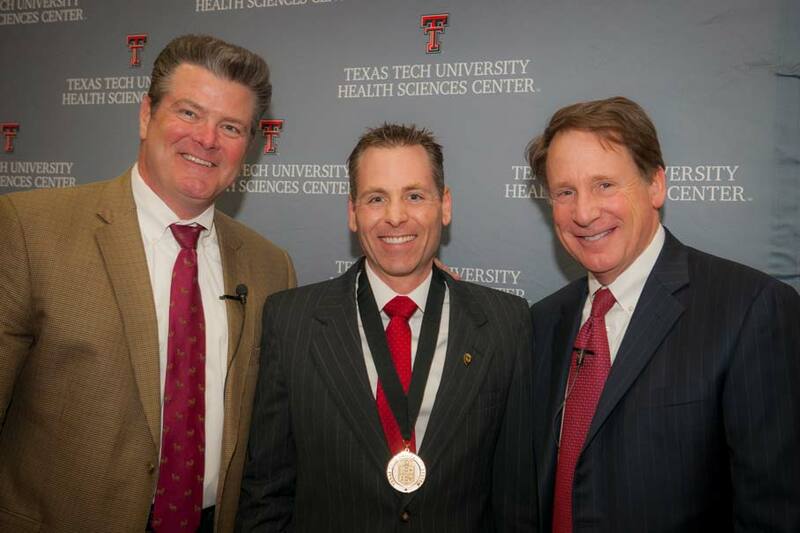 Eric J. MacLaughlin, center, with Texas Tech University Health Sciences Center President Tedd L. Mitchell, left, and former Texas Tech University System Chancellor Robert Duncan during a campus ceremony recognizing TTUHSC recipients on Jan. 25, 2018. A project of the American College of Cardiology and the American Heart Association, the 2017 Guidelines for the Management of Patients with Hypertension were the first comprehensive recommendations for the disease. The American Pharmacists Association selected MacLaughlin as their representative to the writing committee. The group of authors included national experts in the field of cardiology, an epidemiologist, a nurse practitioner and a family practitioner. Mac Laughlin was the only pharmacist in the group. In honor of his career of achievement, MacLaughlin was awarded the Chancellor’s Council Distinguished Teaching Award, the most prestigious honor given to faculty members throughout the Texas Tech University System. He received $5,000 and a medallion for his excellence, funded by annual membership gifts to the Chancellor’s Council — a giving society supporting the priorities of the chancellor by impacting student lives through scholarships, recognizing faculty achievement and encouraging excellence across all four system universities. “I’m very humbled and appreciative of the award,” said MacLaughlin, who continues to teach as department chair. 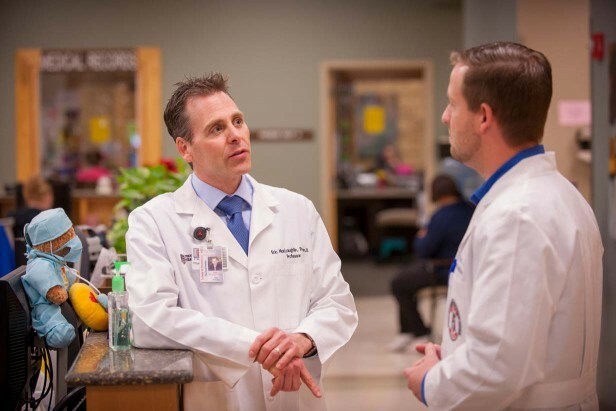 Eric J. MacLaughlin visits with a patient at TTUHSC's clinic in Amarillo, Texas. The Chancellor Council award follows several others for outstanding teaching. MacLaughlin has been named Instructor of the Year and received a TTUHSC President’s Award in Excellence for Teaching. He also has received a number of team-teaching awards. “I think I’m an effective teacher,” MacLaughlin said. “I tend to be pretty high energy. There are no PowerPoints. Part of me, as a teacher, is being able to tell a story and weave in a case or a patient visit. If you can picture that, I think that the concept can really stick. MacLaughlin arrived at TTUHSC’s School of Pharmacy in 1999. “I came down to Amarillo, and it had just opened. Initially, I had a three- to five-year plan, but Texas Tech has been great to work with,” he said. He grew up in a small town an hour south of Buffalo, N.Y. and, as a student, had a strong interest in science, math, chemistry and physics. “I also wanted to help people, but not as a doctor,” he said. MacLaughlin earned a B.S. in pharmacy at Albany College of Pharmacy, Union University, followed by a doctorate of pharmacy at the Medical University of South Carolina. He then completed a primary care specialty residency at the University of Colorado’s Skaggs School of Pharmacy & Pharmaceutical Sciences. “Colorado was a fantastic experience teaching and tutoring. I really enjoyed the scholarship and research,” he said. Eric J. MacLaughlin, left, speaks to a colleague at the TTUHSC at Amarillo clinic. At the TTUHSC School of Pharmacy, MacLaughlin enjoys teaching and has been able to forge collaborative, inter-professional relationships. Teaching, clinical practice and shouldering the duties of a department chair are a balancing act, MacLaughlin admits, but he has a helpful strategy. “I am good at Outlook!” he said, referring to Microsoft’s email-calendar program. 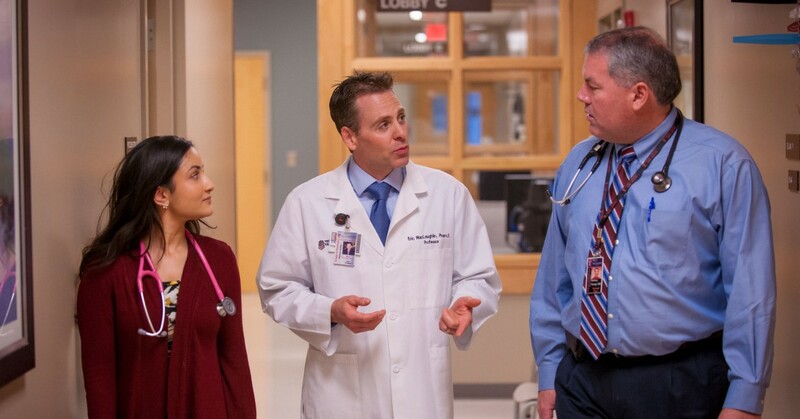 Guarding his schedule gives MacLaughlin more time to focus on what matters most: working with students and health care professionals to improve patient care.